When is a light switch not a light switch? 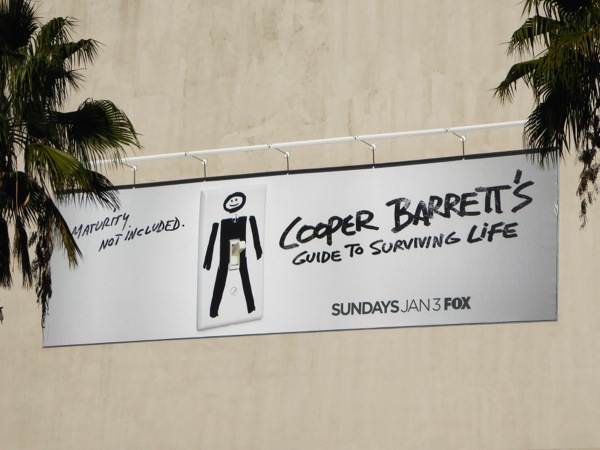 When it's been turned into a rude joke for the amusement of potential viewers of Cooper Barrett's Guide to Surviving Life, Fox's new Sunday night comedy. Jack Cutmore-Scott is the titular 'Cooper Barrett', a twentysomething recent college graduate working on getting his life together, looking for the right job and woman with the help of his screwball friends and older married brother 'Josh' (played by The Hangover's Justin Bartha). 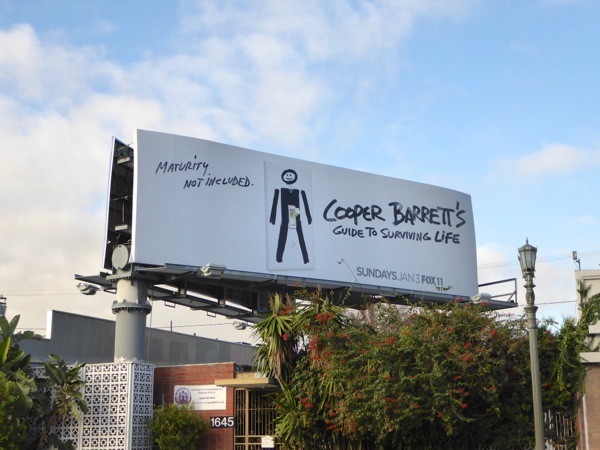 These decidedly immature (but hilarious) series launch billboards for the new comedy, where someone has drawn a stick man over a light switch in all the right places, were spotted along Pico Boulevard at Fox Studios on December 12, then later along La Cienega Boulevard on December 19, 2015. 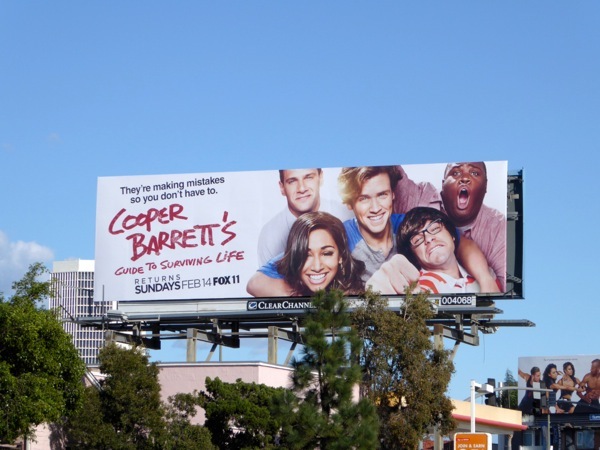 This type of humour reminds Daily Billboard of the launch ad campaign for Bravo's Girlfriends' Guide to Divorce which was designed to look like Lisa Edelstein was giving passersby the finger (rather than showing people the space where her wedding band used to be). Plus for another cool light switch ad creative, be sure to check out this supercool Ant-Man movie billboard along the Sunset Strip from last Summer. Hopefully you've enjoyed another themed TV WEEK at Daily Billboard, stay tuned in the coming days for even more New Year TV show ad creatives and all the latest movie billboards filling the city skyline. 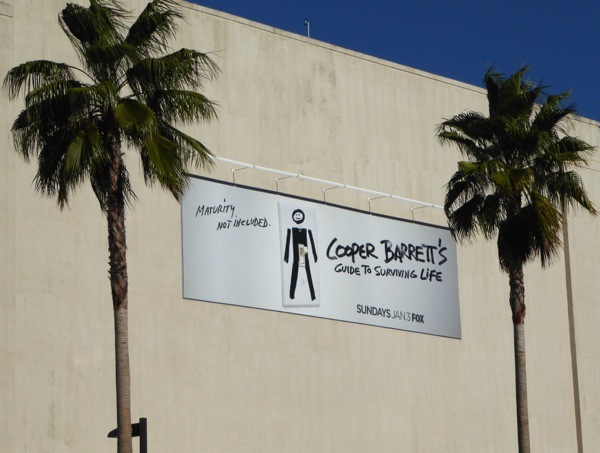 UPDATED: Here's another billboard for Cooper Barrett's first season of episodes featuring the cast, snapped along La Brea Avenue on January 28, 2016. 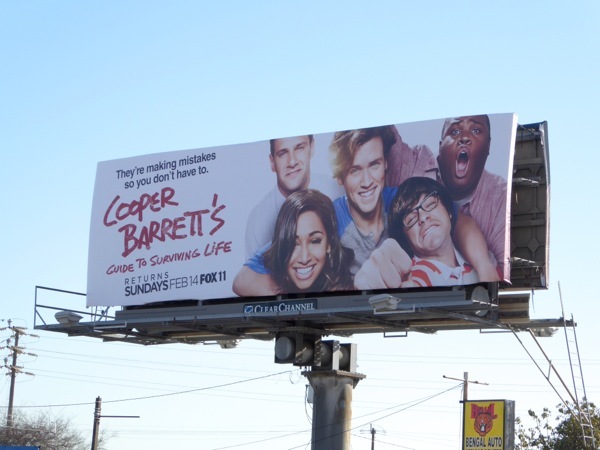 And here's a better shot of the billboard spotted along Olympic Boulevard on February 1, 2016.